Welcome to the webpage of the Fluid PF! • Production of ceramic radiant heaters for gas burners with infrared radiation for increasing efficiency throgh quality combustion of gas fuel. • Awards, received by the Foundation include a diploma of Agency of the Kyrgyz Republic on Intellectual Property for best inventions in 2005-2006, and by the certificate “Best practice in sustainable development in the Central Asia” by “Capacity 2015” ILN/CARNet for biogas plant on Uzbekistan. This website contains information about biogas plants and technologies, developed by PF “Fluid”. «Novyi Put (New way)» farm. PF “Fluid” is awarded with the diploma for active participation at the exhibition held in the Exhibition cente of the National Academy of Sciences, for demonstration of innovative developments and for the contribution to innovation activity. PF “Fluid” was awarded with the diploma for participation at the exhibition held in the Exhibition center of the National Academy of Sciences , and for the active use of objects and systems integration. PF Fluid has developed new National Standard of the KR for biogas plants KMS 1061:2012, approved by the decree of the National Institute of Standards and Metrology dated 2 July 2012 №44. 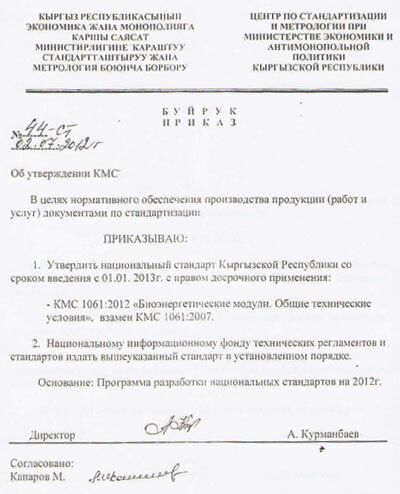 PF “Fluid” has received a patent for portable biogas plant №1424, registered in Kyrgyzpatent on January 31, 2012. The idea of exchanging experience with Democratic People’s Republic of Korea has been born during the study tour on Sustainable Energy Systems in Kyrgyzstan in August 2011, when DPRK delegation has visited 4 biogas plants constructed and supported by PF “Fluid” and was introduced to practical experience acquired by PF “Fluid” in implementation and development of the biogas technology in rural areas of the Kyrgyz Republic. 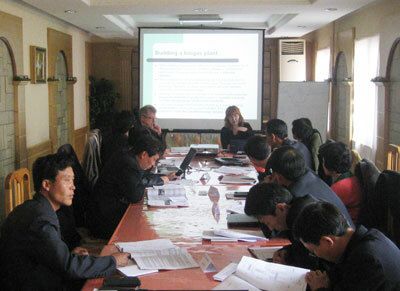 However, the specialists of the PF “Fluid” did not have the opportunity to provide the team with practical recommendations and complete technical information that would increase the potential of successful implementation of biogas technologies in the DPRK due to limited knowledge of the local conditions and technical capacity of DPRK. 3. To build the capacity of stakeholders in DPRK through development of the training module and educational materials for local experts and conducting practical training of trainers (ToT) on construction, equipment and materials for producing biogas plants, operation and maintenance of biogas plants, using biogas and biofertilizer. Existing feasibility study prepared by Thailand experts suggests constructing concrete farm and household biogas plants with no agitation and no heating system, assuming mesophilic (37°C) semi-continuous mode digestion of mixed straw, manure and other available wastes biogas inside of the greenhouse. However, provided in the feasibility study average yearly temperature of approximately 10°C does not allow for operation of the farm plant without heating system in mesophilic regime of 37°C. All-year operation in psychophilic regime of 22-25°C can be only be ensured conditional on either heating of the plant or ensuring constant minimum temperature of 20°C in the greenhouse, but mesophilic regime requires installing a heating system in biogas plant. Planned feedstock composition for farm biogas plants will lead to necessity of constructing larger biogas plants with less than optimal biogas production rates. For example, a 100 m3 digester plant operating on manure with straw and other vegetable wastes (according to schedule suggested in the feasibility study: loading 25 tons of straw at 3-month intervals and 0,4-0,8 tons of manure daily) will be able to provide daily biogas yield of 30-60 m3. However, a 100 m3 steel digester of suggested by PF Fluid design, operating on pure manure will be able to digest up to 6 tons per day in mesophilic regime and produce 200-300 m3 of biogas. Considering availability of feedstock (1 ton with possibility of increasing up to 3 ton), it would be enough to install a 50 m3 biogas plants of optimal construction working on pure manure, which can digest up to 3 tons of manure daily and produce up to 100-150 m3. Also, suggested by Thailand experts household and farm-plant design does not allow sufficient control of the digestion process for optimal production of biogas and biofertilizer and does not take into account usability of the plant. For example, the provided designs do not foresee an agitation system of the digested feedstock, and regular agitation is one of the key elements to optimal operation of biogas plants. PF Fluid has adapted one of the feasibility reports for Mopung cooperative farm to optimize offered solution on individual and farm biogas plants. 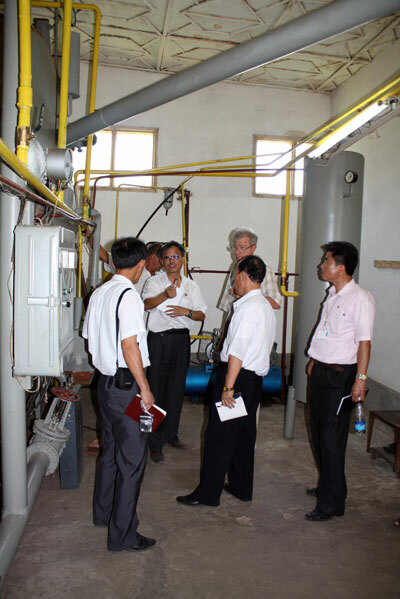 In developing recommendations for household and farm biogas plants to be implemented in DPRK, PF Fluid has been taking into account received information and own 10-year experience of PF Fluid in constructing and operating biogas plants and implementation biogas technologies. Implementing less than optimal or deficient designs can have strong negative influence on the possibility of dissemination of the technology within the DPRK, as the technology will then have a bad reputation, which will be very difficult to overcome. Apart from the necessity of installing agitation system, there’s again the issue of the operating temperature. All-year operation of the plant in psychophilic regime of 22-25°C can only be ensured conditional on either heating of the plant or ensuring constant minimal temperature of 20°C in the greenhouse, where plant is to be constructed. First suggestion of PF Fluid would be to install a heating system (using biogas or local fuels such as straw) in the biogas plant that would allow for psychophilic or mesophilic mode of operation of the plant. access to fuels in the pilot villages, and that there are cases of successful operation of biogas plants in greenhouses in DPRK. However, as PF Fluid have not seen a successful implementation of unheated biogas plant the greenhouse, either in DPRK or in Kyrgyzstan which has similar climatic conditions, PF Fluid would recommend initially decreasing the number of planned household biogas plants to 5 pilot ones, instead of constructing 10-20 plants on each project site, and adding manual agitation system, as discussed with local expert Prof. Kim. After construction of the 5 pilot household plants PF Fluid would recommend monitoring capacity of greenhouse construction to hold minimal temperature of 20°C and capacity of local population for successful operation of the plant for at least a year. Final decision about larger-scale implementation of household biogas plants should be than based on results of monitoring. Taking into account shortcomings in the design suggested by the feasibility study and received from local experts, PF Fluid recommends complete reconsideration of the design of the farm biogas plant and inclusion of additional equipment to allow better control for optimal production of biogas and biofertilizer in DPRK conditions. This reconsideration would mean adaptation of a more optimal and efficient technology of digesting manure. Biogas plants for 4 project farms should have digester volume of 50 m3 and have the capacity to work under “continuous work cycle”, digesting in mesophilic regime up to 3 tons of feedstock per day and producing up to 150 m3 biogas per day. Regime of preparation, loading of the fresh feedstock, agitation and unloading of the digested feedstock in the storage tank or automobile/tractor transport should be semi-automatic, regime of gas collection – automatic. Digester must be equipped with feedstock heating system, which should include water boiler working on produced biogas. Additionally heating system should include separate or combined water boiler working on hard fuel or electricity to be used during the commissioning of the biogas plant. To increase the daily load of the biogas plants up to their optimal capacity PF Fluid would recommend discussing with the cooperatives a possibility of organizing community work on collection of feedstock from neighboring individual households for optimal operation of equipment. Considering insufficient practical experience of local experts in such technologies, as well as on constructing and operating biogas plants using that technology, PF Fluid recommends ordering a turn-key delivery of the first demonstrational biogas plant of optimal construction, that would include heating and agitation devices from experienced manufacturers outside DPRK. The manufacturer should also be asked to organize practical hands-on training during assembly, commissioning and operation of the plant for local experts, so that they would then be able to successfully replicate the technology in other project sites using local materials and equipment. •	Absence of accessible financial and credit mechanisms for rural population.